At first glance Sam Cervantes and his latest invention may seem questionable, but after spending some time talking with him I’m sure what he’s showing off is legit. 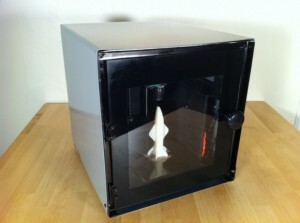 Cervantes and his team are working on the first $500 3D printer, a device known as the Solidoodle. At the risk of sounding cliche, what you’re witnessing in the video is truly game-changing; the Solidoodle is a significant step towards making 3D printing accessible to the average consumer. By now you have heard all about 3D printing and have had the opportunity to drool over the possibilities. Most likely the only thing that has been keeping you from purchasing one for your own home is the price tag, which before the announcement of the Solidoodle would be in the neighborhood of $2000 when all is said and done. Sure, it’s the same price as a high-end MacBook Pro, but it’s a considerable chunk of change for what essentially is at this point a toy for grown-up geeks. During his time in the industry, Cervantes took a look at this fact and decided it was one of the last barriers to break through to allow the technology to move forward through crowd-sourced innovation. He decided that he could design a low-cost 3D printer for the masses and help to get a device in as many people’s hands as possible, and with that came the birth of the Solidoodle. Striking out on his own, using his personal bank account, Cervantes formed his new company and gathered a team of six like-minded engineers to begin prototyping his vision. While many people know Cervantes as the former COO of MakerBot, his expertise in engineering and manufacturing processes runs much deeper. He previously worked at GE as an aerospace engineer designing the engine for the 747 and was employed by two different 3D printing companies, so he has the experience to lead a project with the goal of smashing through the cost barrier that exists for an infant technology. By applying his knowledge of making quality parts for the lowest cost possible, Cervantes and his team were quickly able to assemble their first working prototypes that led to the Solidoodle. By using an Arduino and open-source software for the 3D modeling the Solidoodle team was able to construct a printing device that makes 6x6x6-inch models out of melted plastic filament. While that’s not an very large work space, it’s certainly enough to let you express your imagination. The printing is done by one extrusion head working from the map provided by the software, creating each model layer-by-layer, as it typical with today’s 3D printers. For building materials the company currently recommends using ABS filament, but is working on adapting the device to make use of polylactic acid based or PLA filament. The upside to using PLA is that it’s made from corn, which of course is available in abundance in America. It’s conceivable that as the 3D printing industry grows, you could be replenishing your filament supply with locally grown corn. The Solidoodle looks to be a solidly made piece of equipment. This is reinforced by Cervantes’ claim that a 200-pound person could stand on top of the device — while it’s printing — and not cause any damage. To answer the big question — how could the Solidoodle base model only cost $499? Cervantes went on to talk about how he and his team leveraged the knowledge and experience from their collective backgrounds to slim down the production process to avoid muddying the waters when it came to quality components. What was key for the project was the fact that the whole team was committed to the simple vision of creating a printing device for the masses, rather than just the enthusiasts. Much like your probably felt when you first watched the video at the top of the post, I was skeptical about Solidoodle as a whole. When I asked Cervantes about the lack of credibility the homemade video he released had he replied, “You can tell by the video we created that we aren’t marketers, we’re engineers and tech people that are focused on the “back room” if you will, making things work and getting excited about what we can accomplish.” He assured me that a more professional video was going to be made, but that right now his goal was to make sure all of the pre-orders that have been placed will be filled. While this was certainly reassuring about the veracity of the Solidoodle project, it was the conversation Cervantes and I had at the end of the interview that convinced me that the device isn’t only legit but one of the most exciting that I have seen in a while. Cervantes made it clear that his goal was to do whatever it takes to get a Solidoodle into the hands of anyone who wants one. He has a clear understanding that for technology to move forward at an explosive pace that it must be first accepted and then adopted by consumers, so it must be both useful and easy to use. When talking with him, I was struck not only by how intelligent he is but also by the fact that he’s a pretty humble and non-assuming guy. From the video, you can tell that he’s uncomfortable being the center of attention, something that is refreshing in this day and age of every executive trying to be the next Steve Jobs. Cervantes sees the future of the market depending on getting the younger generation’s hands actually on these machines so they can begin to dream big about what can happen with them. He was describing to me the vision beneath the Solidoodle vision, an altruistic motivation that is both admirable and acts like a magnet drawing people into sharing the dream of having this technology being a major part of everyday life in the world. While Cervantes is certainly capable of thinking in large, abstract terms, he’s fully aware that Solidoodle is simply a step towards seeing 3D printing becoming a new standard for consumers. Currently, he’s aware that the device has a very limited scope in creating useful items, as displayed above when a young lady decides that she wants to test a carabiner that came off a Solidoodle while using a rock wall. The results are certainly humorous, but also serve as a reminder to the Solidoodle team that they desperately need other people to get involved to dream up new ways of creating items using the technology they’ve helped to develop. Which leads to how you can get your very own Solidoodle to experiment with. As mentioned before, you can pre-order a unit for $499, this model comes without a door or case which are just for aesthetics (the process isn’t dangerous unless you stick your hand inside while it’s operating). Cervantes stated that right now after ordering and payment it takes six to eight weeks to build your device and ship it out to you. While this may seem like a long time, know that it comes to you fully assembled, meaning you open it up and start playing right away. You can also decide to drop an extra $100 and get some nice accessories like an interior light, cabinet and door and spool holder to allow you to do other things while the unit is printing. That’s still a great price for a 3D printer in your home.